Bye, bye bear! 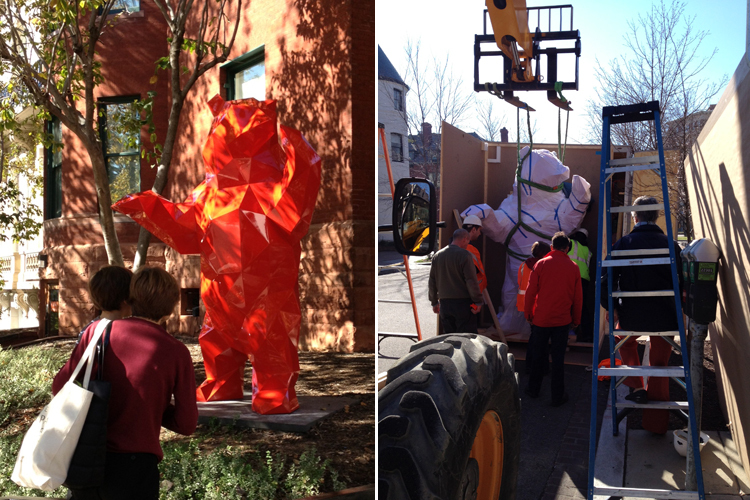 I am touched by the attachment our public developed for Xavier Veilhan’s red bear. It reminds me of the vehement reactions to the departure of Linn Meyer’s wall drawing, another work that was only here temporarily. Our visitors’ emotional engagement is proof of the power of art. You may remember Linn Meyers’s exquisitely detailed Intersections project for the Phillips in 2010, which responded to the brushwork and colors of Vincent van Gogh’s The Road Menders. Meyers again employs thin, tremulous lines in her creation for the glass-walled conference rooms that line the main-floor lobby of Arlington’s Courthouse Plaza. The installation serves as both an artistic and economic solution to the distracting “fishbowl effect” of meeting rooms. The work, Untitled, marks Meyers’s first permanent public art installation and was officially unveiled and dedicated Tuesday morning. The video above shows a visual montage of the creation, design, fabrication, and installation of the work. A special edition print related to her Intersections project, screened on handmade paper and signed and numbered by Linn Meyers, is available in the Phillips’s museum shop.